Bathroom doors offer the first impression of your bathroom and can add greatly to the style and mood you want to achieve. Deciding on the look or finish of your bathroom door is the fun part. Before we get there though, let's put some thought and planning into the practical considerations. Whether it's an entrance door, an internal door for added privacy or an opening door to the outdoors (pun intended! ), they can all enhance - or detract from - your bathroom design. Ideally the view through the entrance door into the bathroom should be of an attractive feature such as a designer vanity or tub and definitely not the toilet. By simply changing the way a door swings open, you can realize better layout and design solutions. Our bathroom floor plans illustrated here show the variety of layouts that can be achieved by simply changing the position of the door and/or the door type. A With a normal hinged door you will very often have dead wall and floor space that cannot be used for anything. B By changing to a bi-fold door, we've opted for a pedestal vanity, but gained space for a generous dual shower. C A pocket door must be the ultimate space saver! By rearranging the fixtures, a more spacious toweling-off area is created. D Corners can be great too for positioning doors. Two pocket doors now free up space for a storage cabinet to the left of the toilet. Design Note: If you and your partner never close the door to your en-suite bathroom, do you even need a door? 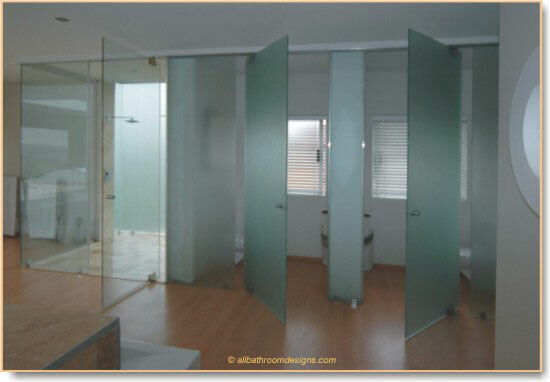 There is a growing trend to incorporate the en-suite into the bedroom with perhaps only a need to screen of the toilet. 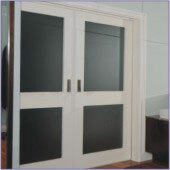 A glass door with a sandblasted motif can be stylish whilst also allowing light from the bathroom through. The style of the door can make a strong statement to support your decorating theme: A barn styled door for a rustic bathroom, a shoji screen for a Japanese bathroom... the possibilities are endless. Perhaps you have an outside area adjacent to your bathroom space that can be screened off and be made part of your bathroom. Being able to open your bathroom to the outdoors will add tremendously to the sense of space and enhance your bathing experience during the warm months. 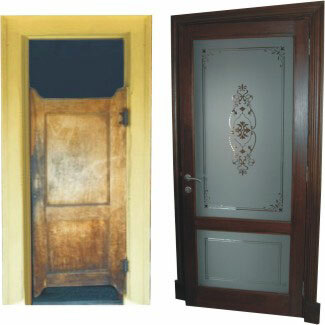 You may want to visit our page on Pocket Doors for a more detailed look at their use. 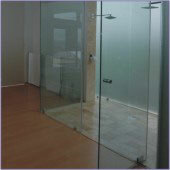 Visit our page on Shower Doors for ideas and practical tips. Our Bathroom Layouts page has graph paper and scaled fittings to assist you with your bathroom floor plans.